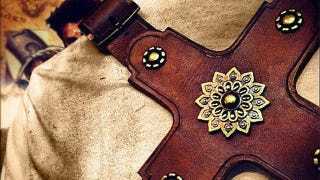 David Vigil, who is a master leathersmith, is taking orders for an item he's called "UNCHARTED 3: Nathan Drake Inspired Gun Holster". While appearing to be entirely unlicensed by Sony, official blessing seems to be the only thing it's lacking. Because it looks incredible. Based on, obviously, Drake's shoulder holster from the third game in the series, it's not just a cosplay piece; Vigil says he makes them to exacting standards, and that because they're thick, waterproof and use proper metal parts each holster "can handle most if not all of what Nathan Drake goes through in each game". If I could afford the $450 he's asking, I'd get one. Just so I could walk around my office all day holding a styrofoam cup pretending I was Andy Sipowicz's sexier younger brother.